Meeting Camila Batmanghelidjh at the secretly-located headquarters of her charity Kids Company feels a lot like being transported into another world: a world where, cocooned from the buzz of the capital’s congested streets, humour, colour and imagination can reign. Born in Tehran in 1963 to Belgian and Iranian parents, Batmanghelidj fled Iran after the 1979 revolution. After working for the NSPCC, studying and training as a psychotherapist, she founded her first charity The Place 2 Be in her early twenties before forming Kids Company in 1996. In 2006, she published her first book, Shattered Lives. In 2013 she was named one of the 100 most powerful women in the UK and awarded a CBE for her work with children. Here, in a grotto in the centre of an unassuming concrete block, beneath twinkling paper lanterns and amidst purple, blue and green walls, the celebrated campaigner works her magic for some of the country’s most vulnerable young people. Her office, if you can even call it that, is a dream-like manifestation of her many success stories, packed full of artefacts collected and made by children the charity has worked with. It is immediately obvious that Batmanghelidjh – who knew she wanted to work with traumatised young people from the age of nine – has a unique ability to relate to children and understand their behaviour. She is utterly unshakeable – “a very angry young man once walked into my office and asked if I wanted him to f*** me, but I just told him I was like his mother now!” – with an extraordinary empathy for society’s most difficult and challenging children and young people. Like her office, Batmanghelidjh is an eruption of vibrant tones and bold patterns. Today, she is adorned with her signature multi-coloured robes and headdress, canary yellow shoes and red lipstick. In a sector dominated by grey suits and outfits chosen to help the wearer blend in, Batmanghelidjh’s attire is a powerful weapon. It makes her photogenic, unmissable and unforgettable – and has no doubt helped to drive the charity’s impressive media profile. There is, however, a much dimmer reason for our meeting today. 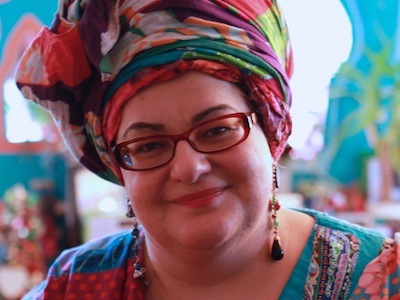 Next month, Kids Company will launch a major campaign following a report by the Centre for Social Justice (CSJ) that will, Batmanghelidjh believes, show why the current child protection system is “totally unfit for purpose”. It is neither a new nor unusual view, but Batmanghelidjh is among a minority of people able and willing to challenge the status quo. The report is expected to reveal evidence submitted by social workers and young people that proves the child protection system is at breaking point. It follows Community Care’s own research, which found 80% of the 600 social workers we surveyed said child protection thresholds were rising in their area. Batmanghelidjh hopes the report will provide hard evidence of these problems; evidence ministers would be unwise to ignore. As a result, Batmanghelidjh has seen a “perverse norm” develop where workers attempt to minimise neglectful situations for children because they lack the money or resources to provide a service. “And then very amoral decisions start being made about what type of abuse you let in through the door and what you don’t,” she adds. Spending time with Batmanghelidjh is fascinating for many reasons, not least her courage and determination to speak her mind. She calls ministers’ recent dismissal of Community Care’s survey “phenomenal arrogance”. “Who do you think you are sitting in your offices? Do you really think you know what’s going on on the ground?” she says indignantly. Of course, that doesn’t mean Kids Company is perfect – she admits to challenges and living hand to mouth as a charity – but they are at least “obsessed with protecting our workers and making sure they’re not getting too stressed out”. It’s clearly worked. Research by the London School of Economics last year found Kids Company workers rate their job satisfaction at between 92% and 97%. I like what Kids Company does for bring out the inner child with play, I totally agree with you that Social Worker have many demands place on them. I would like to see social work go back to grassroot where it started working wih families face to face and do more direct work with them. Before I become disabled I work directly with the children and their families, I could observed all situation of the family’s life and with the parents we pick the problems apart and out them back to gether. For example, I would talked to parent about alcohol misuse and domestic violent to support them to find solution and support. I go the last mile as a social worker, I support parents to go back into education, training and employment and this left their worth, self-esteem and give them comfident to engage with their children. Children is very intelligent being they are curous and witty and at time they use drawing to expressed themselves. Thank you for helping helping the mental health of the nation, your work is having far reaching effects. I was lucky enough to see Camila at Community Care Live earlier this week and she made the same points in your article. What struck me about her, not just her charisma or eloquence but her knowledge and passion. I left the session wondering how I could get the opportunity to work for or with her. I agree generally with everything in the article, however I question then need of ANOTHER report. Everyone with the smallest peice of common sense, knows what the issues are. What we need is action, social work needs to stand up for itself and our service users. Society needs to stand up to politicians. We need to see change rather than reports, are the unions doing anything? Are any of the political parties offering alternative policies to manage this? The actions from the Munro report would help support change, but I feel that it has been forgotten. What are the college of social work doing? I hope that ms batmanghelidjh can use her media position to illicit change. But let’s make one thing clear that access to services is hard, I have made multiple referrals to kids co. which have been refused. Bravo Camilla! But this 15-year plan; obviously it is what is needed but how to achieve it? College of Social Work, Chief Social Worker+ BASW lobbying all the major parties?